In April 2017, Konecranes won another order for diesel-electric Konecranes Gottwald Mobile Harbor Cranes from its long-term customer SEA-invest. 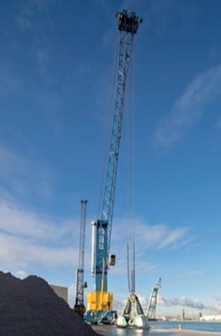 SEA-invest will add three Model 6 machines to its existing fleet of 36 cranes. Thanks to Konecranes’ continuous production concept all three cranes will be put into operation this year. The order includes two Model 6 four-rope grab cranes for bulk handling (max. capacity 100 t, max. outreach 51 m) for SEA-invest’s terminals in Ghent (Belgium) and Rouen (France) as well as one Model 6 two-rope crane (125 t, 51 m) for Antwerp (Belgium).